We give you all the tools you need to understand your health better by linking some of the best heath information websites with your own GP-held electronic health record. We bring your personal HealthSpace in the same place so that you can even access your personal data that you may be monitoring eg blood pressure, peak flows, blood sugars, smoking or weight. There are no long-term commitments or hidden charges when you use Records Acccess. The service is completely FREE as part of the NHS care that you get - free at the point of delivery for all. We've brought together all the information you need to enable you to decide if you want access to your electronic health record as easy as possible. We have even moved a paper based questionnaire to an electronic one so that the only paper you have to print is the consent form and we're even working on an electronic form for that too! There is no software to install, and no complicated manual to try to understand. The practice web-site has everything you need to start looking at your electronic health record and make sense of what it means and what you could do next! You can easily see your records, medications, past medications you have been on, immunizations you have had, blood tests, X-Rays, CT scans, MRI scans, ultrasounds, letters from any hospitals or other clinics or services you may have visited and from there relevant links to websites that give you more information about health conditions you suffer from or may be at risk of developing. Although we have started you off by showing you trusted websites that we vouch for, you can even store your own personal favourites that you have come across in HealthSpace as well as issues you may have that you wish to discuss with another health care professional when you next meet them. Best of all, these can be used in any setting that has internet access - in the surgery, when you go to the hospital, when you have a medication review with the pharmacist, on your iPhone or other internet enabled gadget or when you are on holiday, 1000s of miles away from home! Over 60% of GP practices have now been enabled to allow their patients to access their GP electronic heath records just like ours. 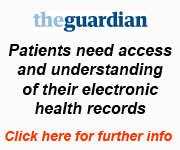 Presently over 40 practices around the country have patients who are accessing their records. 3 practices within Tameside & Glossop are now offering the same service. We have a small team in the practice that deal with any queries relating to Records Access. Katie Rumney based at Thornley House Medical Centre is the main contact although Dr Hannan is very happy to call you for further assistance too. We are able to respond to queries quickly and easily and post any general issues on the practice website under FAQs. We pledge to respect your privacy but also your right to access health information whenever you need it and wherever you need it (subject to certain pre-conditions as set out in the Data Protection Act). Any data that you collect is kept completely and absolutely confidential on HealthSpace. To date, we have developed the website on goodwill and altruism and are keen to keep advertising out. We have however set up a local Care Record Development Board within Tameside & Glossop which supports patients, clinicians and managers in the NHS and Social Services to ensure the very highest standards of care and handling your personal data are met. Have a feature request? A suggestion? A complaint? We are always open to new ideas, and we always welcome constructive criticism. The best ideas come from you. Why don't you send any comments to htmcpatient@nhs.net, respond to one of Dr Hannan's blogs, ring the surgery and leave a message for us or come along and voice your opinion at the next Patient Participation Group meeting.